This photograph, now 20 years old, perfectly encapsulates this Shifting Grounds project that was completed for curator Dieter Roelstraete's MCA exhibition, The Way of the Shovel. In the course of the project's previous "chapters," this land site began as the surface of Lake Michigan where in the mid 1860s, 35 feet beneath the lake bed, a tunnel introduced the city's first fresh water; today's museum is located squarely on land that was once a water basin. By the time Cap Streeter arrived in the mid 1880s, garbage was being dumped in the lake to create new land, the Lincoln Park Commissioners were planning the new Lake Shore Drive, and legal entanglements regarding who owned the land abounded. In 1915, the Illinois Governor swapped a piece of land with the Lincoln Park Commissioners and in two years a massive stone armory stood on the site. Two building additions in a thriving neighborhood, another land transfer, and nearly 75 years later, in another real estate swap, the Museum of Contemporary Art arrived on the parcel. The armory was demolished, the land cleared, and another group of hopeful people grabbed their shovels to break ground for this next chapter. Pictured from left to right, are: Governor James Thompson, Illinois State Representative Sydney R. Yates, MCA CEO Kevin E. Consey, MCA Architect Josef Paul Kleiheus, MCA Trustee Beatrice Cummings Mayer, NEA Chair Jane Alexander, Chicago First Lady Margaret Daley, MCA Board of Trustees Chair Allen Turner, and MCA Trustee Joseph Shapiro. Of the nine people pictured above, four have passed away. Second from the left, State Rep. Sydney R. Yates, who served for 48 years in the House of Representatives, died in 2000 at the age of 91. He was married to Adeline Holleb, sister to Marshall Holleb, the MCA's first attorney and charter member of the museum's board of trustees. Fourth from the left, the MCA's architect, Josef Paul Kleihues , passed away in 2004. 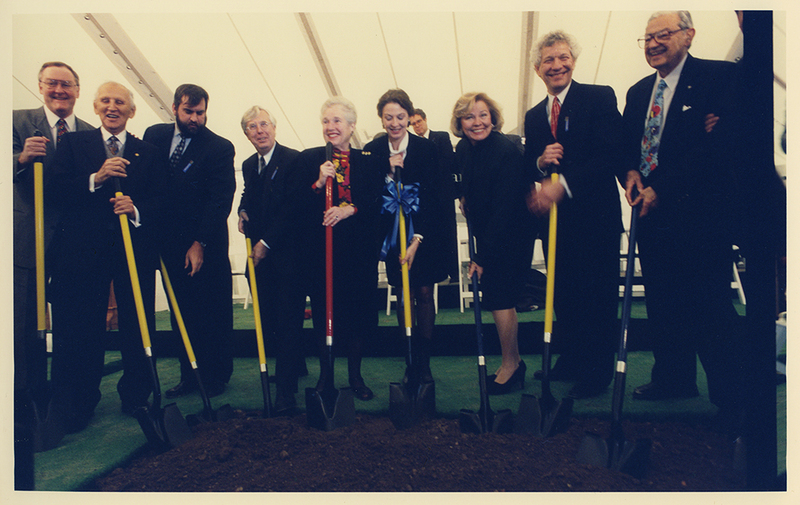 Third from the right, Maggie Daley, Mayor Richard M. Daley's wife, succumbed to cancer in 2011. At the far right, Joseph Shapiro, a founding member of the MCA, passed away in 1996 at the age of 91. Of the remaining shovelers in the photograph, Kevin Consey, third from the left, and Allen Turner, second from the right, participated in this project by allowing me to record conversations with them about their part in the museum's transition years. Governor James R. Thompson, at the far left, did not respond to numerous queries. Also pictured above at fifth from the left is Beatrice "Buddy" Cummings Mayer, who donated $7.5 million for the museum's Mayer Education Center, and at her left is the chair of the National Endowment for the Arts, Jane Alexander.